Just like regular guinea pigs, skinny pigs have some simple but specific care requirements to keep them happy and healthy. A well cared-for guinea pig can live for ten years, though an average lifespan is around 5-7 years. They are vocal little critters, and often good at letting their keepers know when something is not quite right. 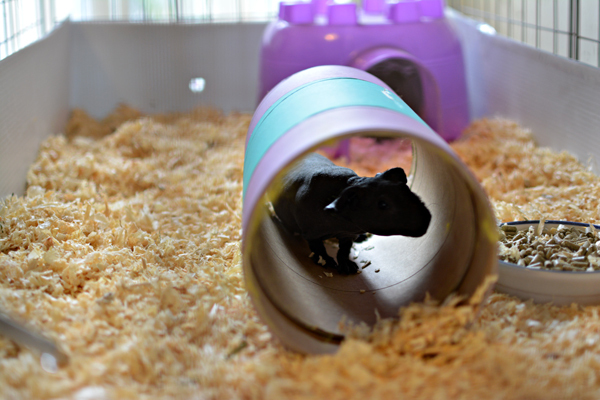 There isn't exactly a "right way" to keep your guinea pigs, and it's important to develop a care routine that you can maintain even when life gets busy. 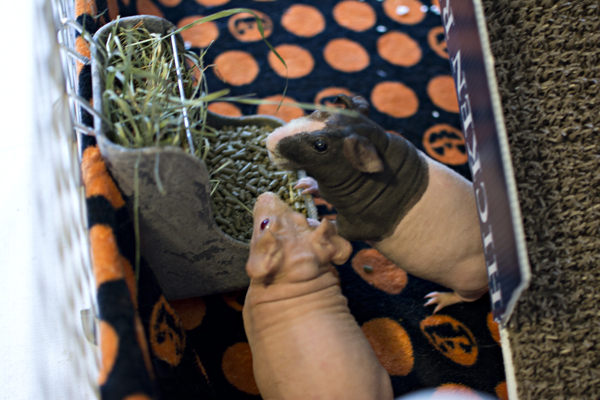 "K" and her skinny pig Goldilocks, from our caviary! Every skinny pig needs a place to live. Though cages with shelving and multiple levels can be purchased, for the most part they prefer roaming in a big flat space. Unlike many other small furry pets, guinea pigs do not jump or climb. This means that there are a number of different housing options for them. If there are dogs or extremely ambitious cats in the house, you will need to consider protection from these housemates when choosing housing for your pigs. Store-bought cages are usually enclosed, but rarely provide enough space to run around. Though small cages are often marketed for guinea pigs, they are not actually good for them. Guinea pigs need room to run around in order to stay healthy. Additionally, small cages need to be cleaned often, sometimes every day, or else that can affect the health of your pets as well. Very large store-bought cages are often hard to find and tend to be prohibitively expensive. The cage pictured above is useful for transportation or travel. 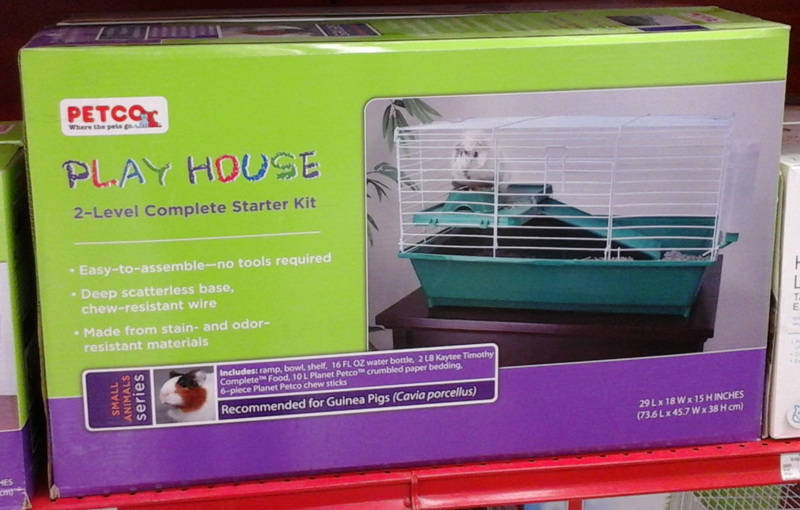 We feel this is not large enough to be a long-term home for a guinea pig, even though it is advertised as a "Complete Starter Kit". Homemade cages and enclosures are inexpensive and relatively simple to make. They allow for large amounts of floor space and often only need to be cleaned every week or two to keep them fresh. SB Skinny Pigs recommends cube-and-coroplast (called C&C) cages. These are made with storage cube squares that cost around $20 for a box of 10 at Kmart or Target. The metal grids are also often available at Bed Bath & Beyond, online at Staples.com (black or white or red) or sometimes on Craigslist. The pan of the cage is made out of coroplast, a material that looks like corrugated cardboard and can be purchased from Home Depot for $16 for an 8' x 4' sheet (and is probably also available at other home improvement stores) or can sometimes be found for free after political campaigns or retail special events are over! www.GuineaPigCages.com has simple plans for making all sorts of custom C&C cages. They also sell pre-made cages. 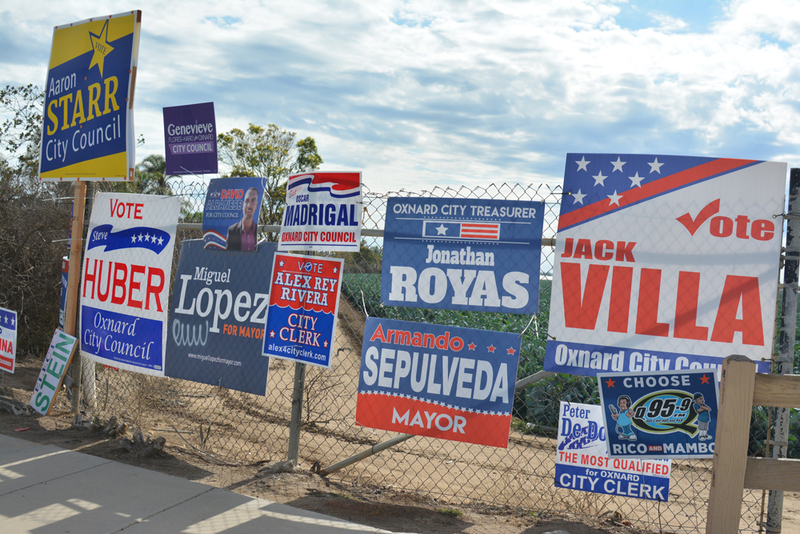 Big political signs (corrugated plastic ones) make great free cage bottoms after elections are over! The C&C cage above is one of our smaller ones (our Honeymoon suite). We use it for breed pairing or pregnant mothers. An alternative to making your own cage is buying a MidWest cage online. These are inexpensive and a suitable size to house two guinea pigs in, provided they also get plenty of time outside their cage to run around and play. The basic open-top MidWest guinea pig habitat tends to cost about $30-45 on Amazon. The MidWest guinea pig habitat plus comes with a cage top and tends to run $40-$65 on Amazon. Another benefit to the MidWest cages is that they can be connected together to make bigger and longer runs for your pets! Guinea pigs need to have soft, absorbent bedding in their enclosures. The right type of bedding is important because these little guys walk around with their mouths and noses very close to the floor. This is one of the reasons having a clean cage is so important, guinea pigs forced to live in a smelly cage or with the wrong type of bedding can develop breathing issues and respiratory illness. Wire cage floors are easy to keep clean, but they are not healthy for guinea pig feet. Even furry guinea pigs have hairless foot-pads on the bottoms of their feet. They need something soft to stand on all day. Wood shavings are the most economical type of bedding, but they need to be made out of low-odor wood. Aspen or kiln-dried pine are both good choices. Fluffy, soft shavings are preferable, and these can usually be purchased inexpensively from feed stores. Pet stores usually carry paper bedding for small animals, and this can be used by itself or mixed with shavings. Cedar and other smelly wood shavings need to be avoided because they are toxic and can cause breathing problems in guinea pigs. Fleece blankets are another option for people who don't mind the laundry. These often need to be changed every day, but aren't nearly as messy as other bedding. Skinny pigs do not have any natural protection from either cold or sun, they need to live indoors and away from direct sunlight. Furry guinea pigs are sensitive to heat and need to be kept somewhat cool, skinny pigs tolerate heat a little better but usually need a hiding place where they can snuggle up and keep warm. Guinea pigs love to have places to hide. Wood and plastic houses are readily available at pet stores, but cardboard boxes also work just fine. Litter boxes are a good way to make cage cleaning more efficient and provide maximum clean space for your pets. Training guinea pigs to use them tends to be pretty easy - start by watching where your pigs like to "go" already and put the litter box in that corner. It shouldn't take long for them to adapt to going in the box! Guinea pigs are grazing animals, like tiny horses. They can have fruits and vegetables as treats, but the majority of their diet needs to be hay, guinea pig pellets, and fresh grass. Unlike most pets, guinea pigs cannot make Vitamin C inside their bodies, they need to get it from the food they eat. The best source of Vitamin C is a pelleted food that is specifically for guinea pigs. Foods made for rabbits and other pets do not contain Vitamin C. Plain pellets made from grass hay, orchard hay, or timothy hay are the best choice. Alfalfa pellets have more protein and calcium than other types of pellets, and are only suitable for baby guinea pigs. Guinea pigs love hay more than nearly anything. They love to munch on it, and hide under it, and play in it. There are several different types of grass hay, and all of these are suitable. Timothy hay, meadow hay, and orchard hay are all types of grass hay (Santa Barbara Skinny Pigs uses orchard). Alfalfa is a legume hay, it is too high in protein and calcium for most guinea pigs. 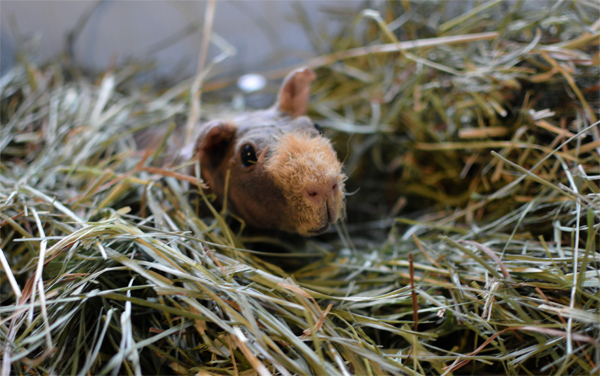 Alfalfa is a stiff and pokey hay that is more likely to scratch delicate skinny pig skin. The freshest, softest grass hay usually comes from feed stores. Most will sell it by the flake, which is a small portion of a bale. Carrots are a favorite treat for most guinea pigs. Apples are also appreciated. Dark leafy greens like kale, collards, beet tops, parsley, broccoli, and radish tops are all good treats. Wash them just like you would if you put them into your own salad. Very watery foods like celery are best for situations like travel where guinea pigs may not have access to water at all times. Fresh grasses can be offered with care, they should not be from lawns that have been treated with any sort of pesticide or weed killer. Most guinea pigs love grazing on the lawn and enjoy supervised time in small pens outdoors. 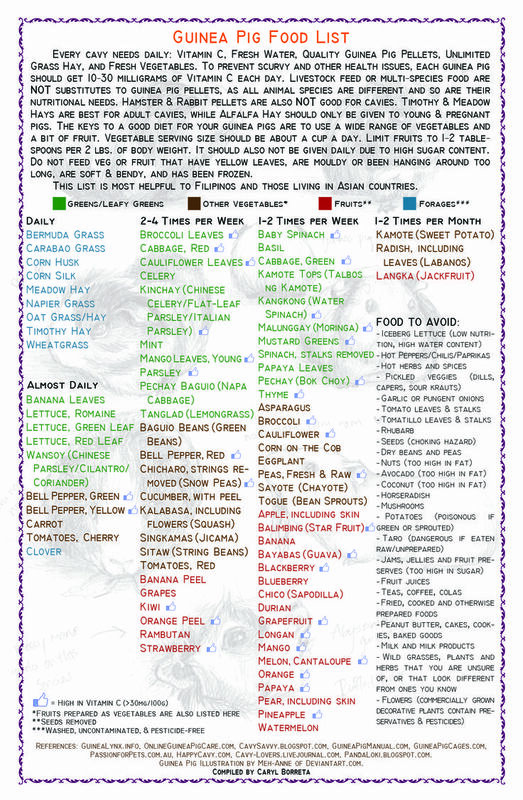 You can find a good list of guinea pig suitable fresh foods here. Fresh, clean water should be available at all times. Open dishes can be tipped easily, store-bought bottles are usually the best choice for guinea pig enclosures. Skinny pigs are typically quite healthy, but there are some illnesses that they are more prone to than their furry counterparts. 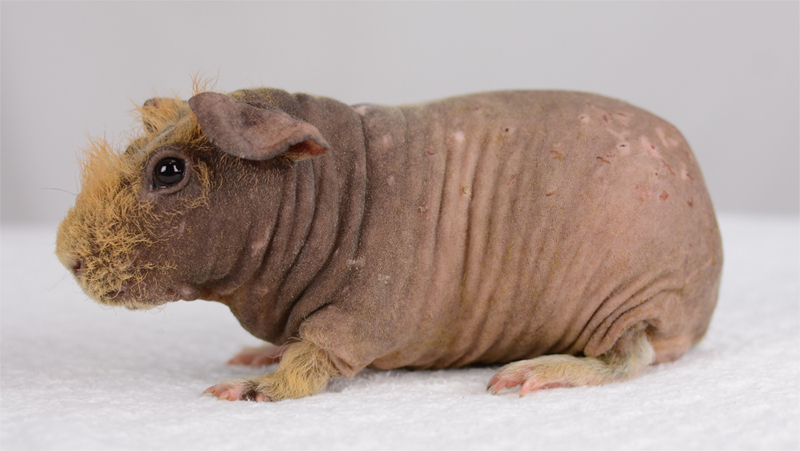 Skinny pigs never get (or almost never get) guinea pig lice, but they are more likely to suffer from skin ailments, including sunburn, skin cancer (from exposure to the sun), scratches or skin infections such as ringworm. All guinea pigs have relatively sensitive digestive systems and care should be taken not to suddenly change the type of food, water or bedding that you use. Changes to these things should be made gradually whenever possible. Remember, the best offense is a good defense! Know your guinea pig and his or her personality so you will notice changes in behavior or attitude in time to treat any illness that might come up. Any of these symptoms should be treated seriously many may warrant a trip to your veterinarian. Make sure your primary and backup veterinarians are familiar with guinea pigs as many of their health concerns are very different from other small animals. Doctors inexperienced with guinea pigs may accidentally prescribe medication that is safe for other pets but can be very dangerous to guinea pigs, such as certain antibiotics. This guinea pig received multiple scratches and possibly bites from a cage-mate. 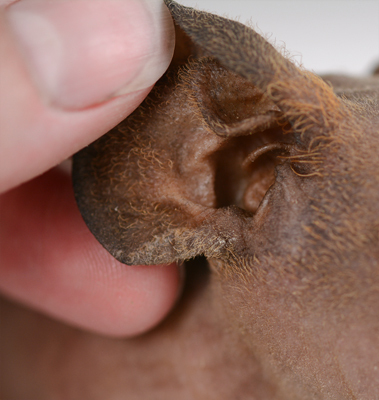 Regularly check ears and folds of skin on your skinny pig's legs and neck thoroughly for skin issues such as this scaly patch on the bottom of a young pig's ear. Skinny pigs will keep themselves quite clean on their own, as long as the cage they are in is also kept clean enough. They use their tongues and paws to groom themselves and there is rarely any real need to give your skinny pigs a bath. We don't recommend it unless they need it for some specific reason. If your skinny pig becomes dirty, you can first gently spot-clean them with a paper towel dipped in warm water. 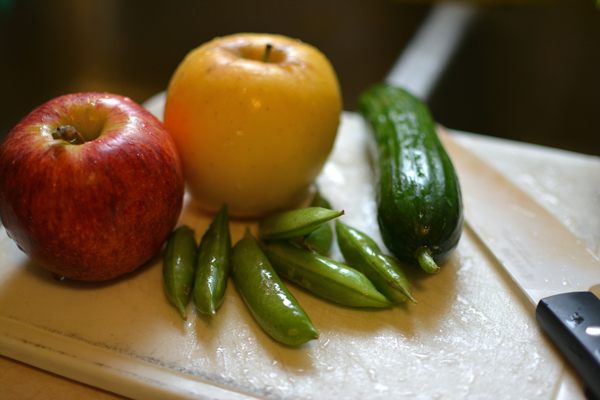 If this isn't sufficient you can wash them in a clean sink or tub or pan with warm water only. If this still isn't enough, the skin care product we use on our skinny pigs is Aveeno Baby Cleansing Therapy. To use, get the skinny pig damp with warm water, and squeeze a little of the product into the palm of your hand (about the size of an almond). Rub your hands together and then rub your hands on your skinny pig, massaging the cream on its back, shoulders, neck, belly and legs. Do not apply to the face or head. 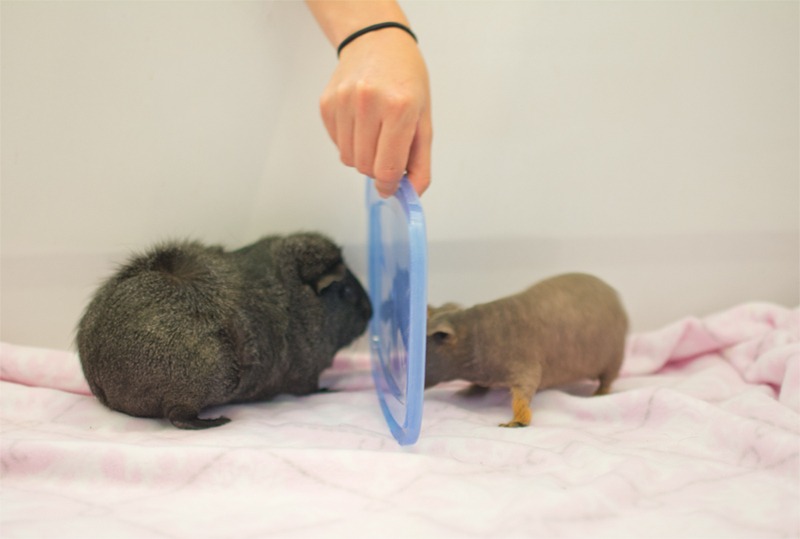 Rinse off gently with warm water, taking care to avoid getting any water into your skinny pig's nose or mouth or eyes. Once all the cream is rinsed off immediately towel dry your skinny pig and keep it warm and supervised until it is 100% dry. Do NOT use a hair dryer as this can cause skin burns. How familiar am I with skinny pig care? Am I willing to make a 7 year commitment to my skinny pig? Who will my primary veterinarian be? Who will be my emergency veterinarian and/or backup? Who will care for my skinny pig when I go out of town? How will my skinny pig stay happy and entertained when I am not home? Do I have room in my house for a large cage? Is the space appropriate (temperature/shade/etc.)? How much time do I have available to spend with my skinny pig? 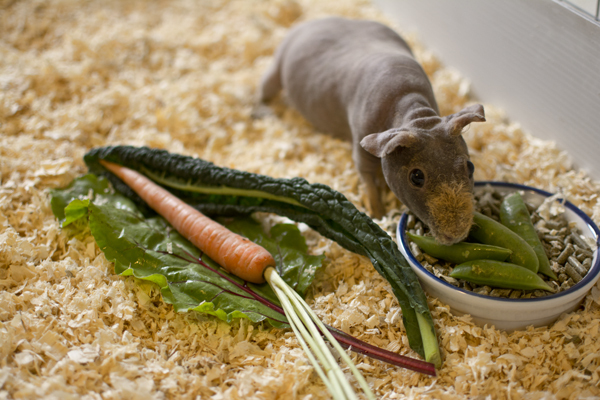 Can I adequately protect my skinny pig from my other pets and from household dangers? Who else will be responsible for the skinny pig's care and health? 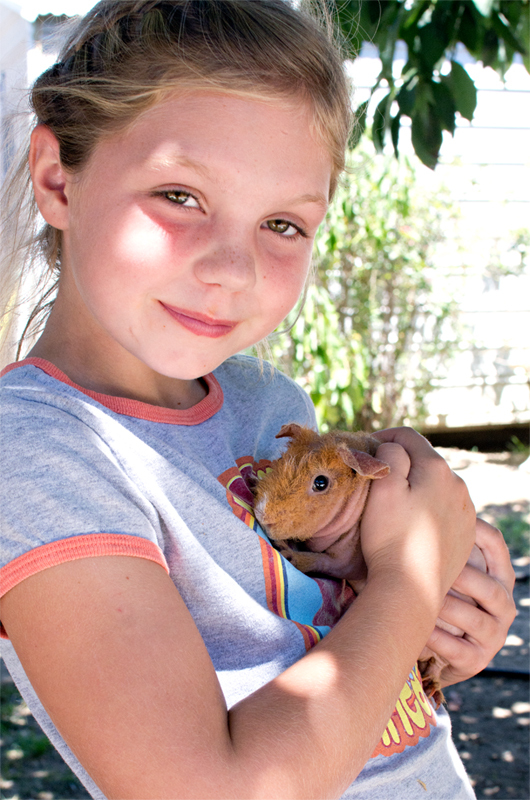 Will all children and/or family members be gentle and play safely with the skinny pig? Pet guinea pigs should be kept in same-gender groups of at least two whenever possible for optimal mental, emotional and physical health. In households that have both male and female guinea pigs, the genders should either be kept in separate cages or the males should be neutered. We do not recommend neutering if it can be avoided as any surgery is risky for small animals. It is best if you can introduce guinea pigs to each other when all are very young (under 12 weeks old). Unfortunately, that's rarely and option so the next best thing is for new guinea pigs to be introduced to adult(s) when the new guinea pigs are extremely young (again, under 12 weeks old is best). Adult guinea pigs are rarely aggressive or violent towards baby guinea pigs, though some rumbling, purring, strutting, dancing or other dominance behavior is still normal. Guinea pigs should be introduced in a neutral environment, so none feel overly territorial. Extra veggies, piles of hay, grass, and/or tunnels will help add distractions and let the guinea pigs get to know each other gradually and safely. You should not use typical hide boxes until all guinea pigs are getting along well, since it is easy for a guinea pig to go into a hide, a second guinea pig enter the hide, and the first one suddenly feel trapped, without an easy way to get more personal space. If there are tensions between two guinea pigs, a hide box will often push things over the edge. Tunnels work much better because there is usually an easy escape for a guinea pig who feels their personal space compromised. The exception being long narrow tunnels in cages with three or more guinea pigs, as one can get stuck in between two others. Short, very wide tunnels are best. These can be purchased at pet stores or you can make something at home with an old cardboard box. Cut the ends off, and one side off, and tape the three pieces together again so you have a triangle. It will keep its shape but allow guinea pigs to easily run all the way through it. If you introduce guinea pigs together and they begin to fight, try to allow them to work out their issues without stepping in, unless a guinea pig is injured to the point of bleeding. Unfortunately this can happen quite quickly with skinny pigs since they don't have fur to protect them, so extra care must be taken with skinny pig introductions. During supervised play time, keep a dustpan or hand broom or other such object handy so you can place it between two guinea pigs who are becoming agitated. It is also important to remember that every time you separate the guinea pigs because they are fighting, everything pretty much resets to zero. You must be able to get them to a state of tolerance in one go, even if that one go takes a long time. Otherwise you will merely be repeating the process again and again and even possibly making it worse over time since the guinea pigs will learn that fighting makes the unwanted guest "disappear." If supervised introductions in a neutral area go well enough, the guinea pigs can be put into a cage together. The bigger the better if there are still any tensions. Ideally it will be a cage unfamiliar to any of the guinea pigs, but the next best thing is a very clean cage. Try to clean all the previous smells from it so no guinea pig will feel overly protective of it. Again, remove hide boxes for now, and add lots of distractions like hay, veggies and big tunnels. Curtained areas that are easy to get in and out of are also great as they add areas where guinea pigs can break line-of-site with others they aren't partial to. 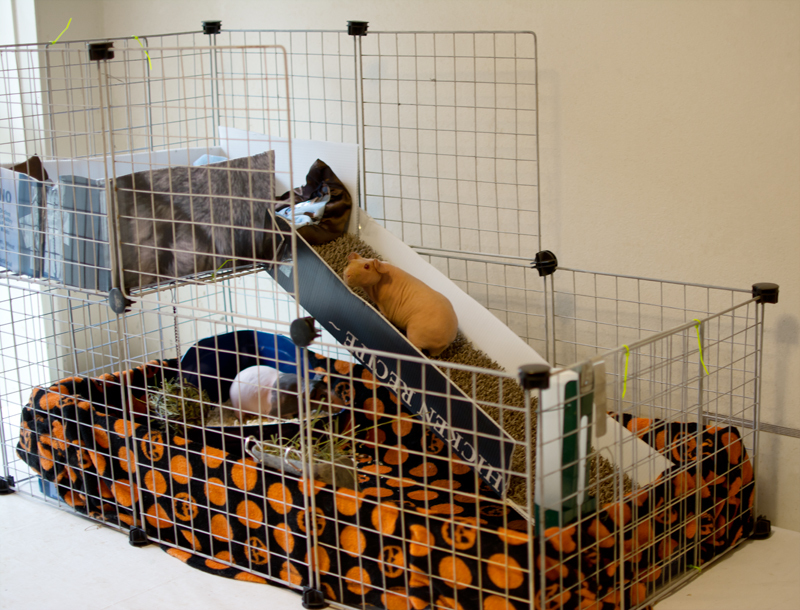 Having a cage divided into two with a wire mesh panel is another way to help guinea pigs get accustomed to each other. This lets them spend all day next to one another without being able to hurt anyone. This, combined with supervised play periods can be a way to let adult guinea pigs gradually become friends. A "buddy bath" is another thing to try that works very well with some guinea pigs. The premise is that if you give two guinea pigs a bath together and they share this unpleasant experience together AND they end up smelling not at all like they normally do, they will get along after that. It has been a big turning point for many guinea pig relationships but of course does not work in every situation. A buddy bath is just like a normal bath except it should take longer to ensure the guinea pigs appreciate the time together. As long as they are kept warm and avoid any chance of getting a chill, there is no significant downside to having a buddy bath to encourage a relationship. A Guinea Pig That Prefers To Be Alone? More likely, this is a guinea pig who does not get along with just about any other guinea pig he or she has ever met. We don't believe this means there is no suitable friend out there for him or her, but some guinea pigs are pickier than others when it comes to making friends. We encourage you to keep trying, and at least have them live in a cage directly next to another guinea pig so they do not have to be entirely without their own species for company. Play dates at a local park, trying introductions with a recently weaned baby guinea pig, or a buddy bath are good things to try with curmudgeon guinea pigs.